ECLECTIC STYLE: Light gray woodgrain color and streamlined appearance coordinates with most home décor styles and room color schemes in your child’s room! 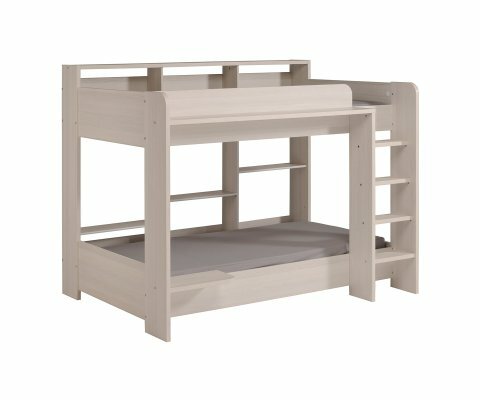 BUILT TO LAST: Made from top-grade MDF boards and joined with heavy-duty steel hardware, your bunk bed will be stable and strong for years of use! DURABLE FINISH: The premium veneer finish is designed to withstand daily wear and tear, and is resistant to scratches, stains, water ring damage and fading or yellowing from UV rays. 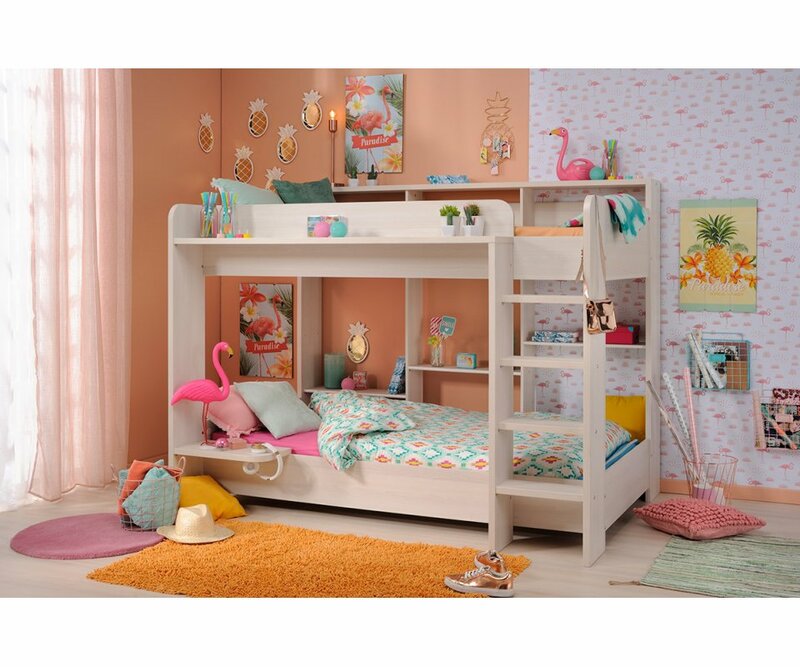 SAFETY FEATURES: A built-in ladder stays securely attached, and front panel on the top bunk adds a protective guard rail. The bed is manufactured with low solvent emissions, which is better for kids with allergies and asthma! ORGANIZED STORAGE: There are bookshelves and display shelves for a lamp, toys, stuffed animals, and favorite treasures on both upper and lower bunks! RoomSmart’s Higher Bunk Twin over Twin Bed is designed to provide quality, space-saving and organized storage features for your child’s room! 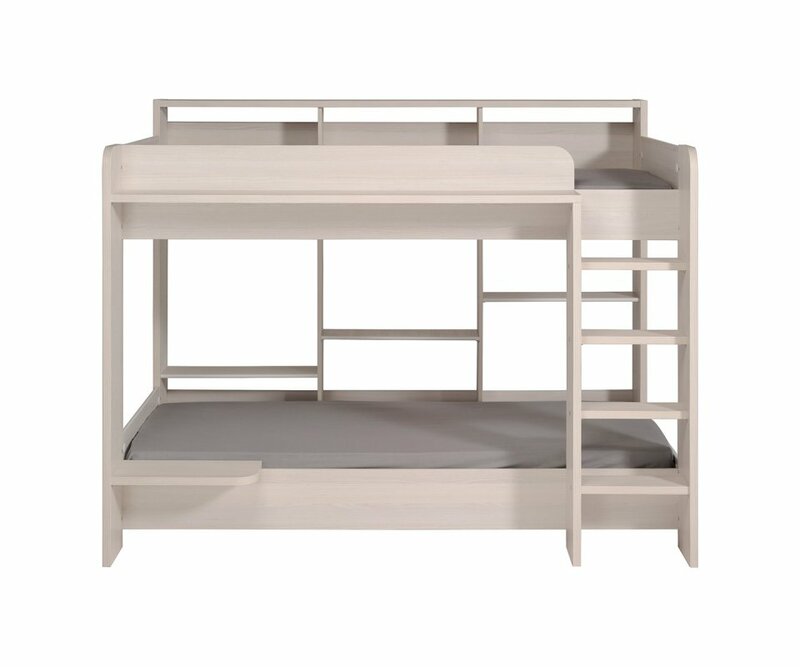 The Higher Bunk is made in a light gray woodgrain color, with streamlined appearance that coordinates with existing room furniture, color scheme, and bedroom theme! The veneer finish is lustrous and durable, resistant to scratches, stains, water ring damage, and fading from UV rays. Thoughtful attention to detail has been given to safety and storage. There’s a built-in ladder for safe climbing to the upper bunk, and a front panel on the top bunk that adds a protective guard rail. 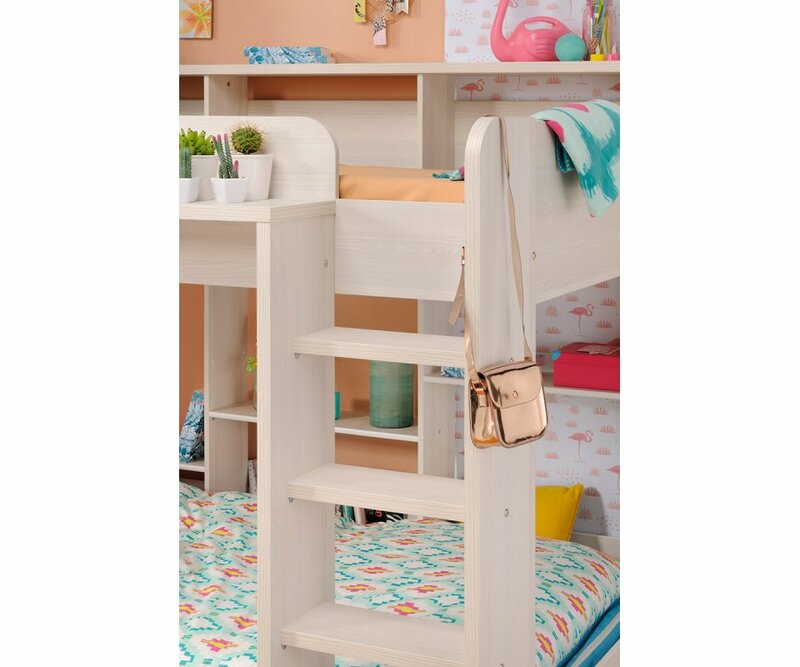 The back features lots of shelves for books, toys, stuffed animals, and treasures, while the front features a full shelf on the upper bunk and short shelf on the lower for a lamp, collectibles, and things kids want to keep close by them at night! 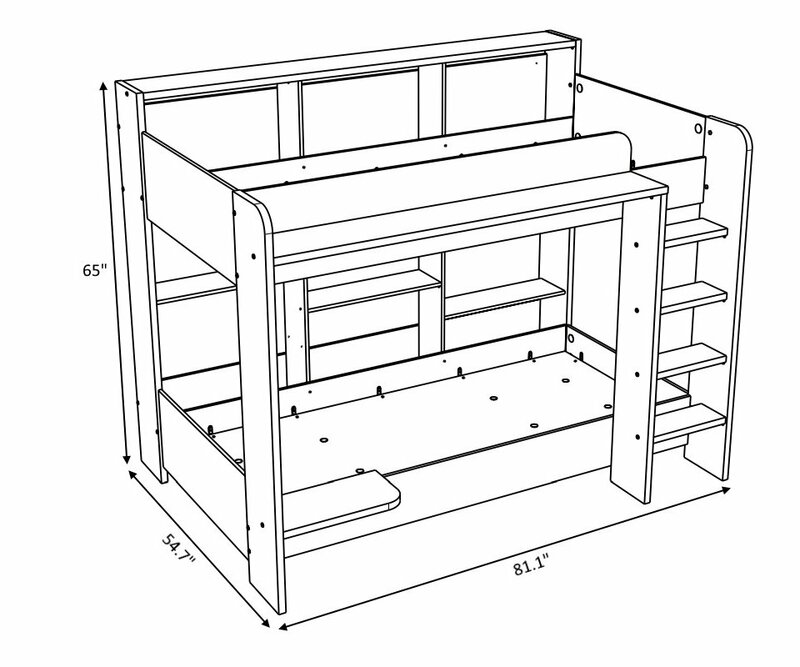 You will love the durability, beauty, and space-saving storage of the Higher Bunk Bed! 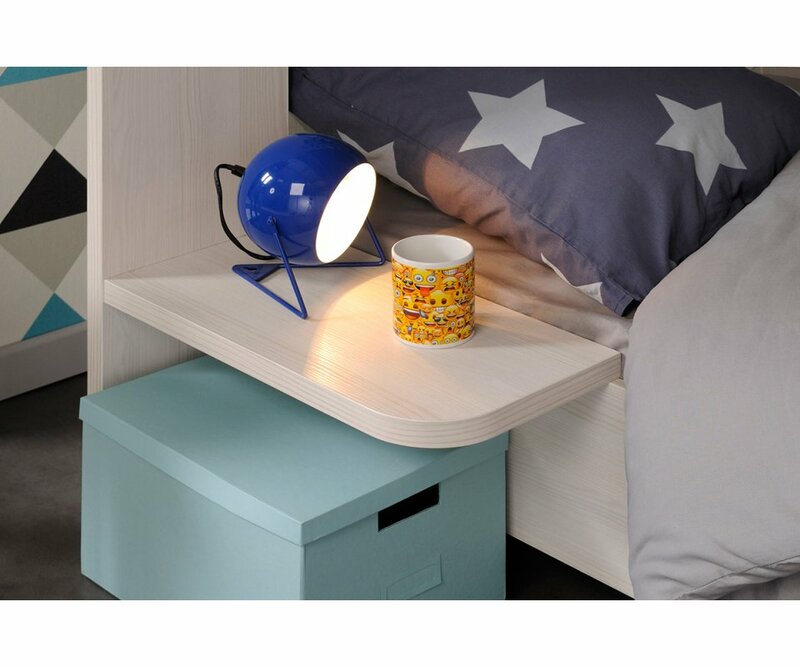 CONTEMPORARY STYLE: The sleek panel bed style adds a modern, eclectic look to your child’s room. It is an easy bed style for kids to make their own bed, too!TWO-TONE COLOR: Light-toned Ash woodgrain and Light Concrete stone colored veneer finishes add an industrial wood/stone combination that.. UNIQUE DESIGN: The asymmetrical wardrobe door design adds eye-catching appeal, and creates an industrial effect, with steel door handles and stenciled lettering accent!BUILT TO LAST: The wardrobe is built to be strong and long-lasting, made from premium MDF boards, and put together with heavy..
INDUSTRIAL STYLE: The wood/stone combination finish, as well as industrial style drawer pull create a cool environment for your child’s self-expression of preferred colors and favorite things!TWO-TONE COLOR: Light-toned Ash woodgrain, accented with Light Concrete stone effect is a neutral col.. ASYMMETRICAL DESIGN: The abstract geometric style of the offset drawers adds a unique design to this industrial-inspired chest!TWO-TONE COLOR: The natural look of wood and stone in the Ash woodgrain and Light Concrete finish on the chest will blend with most color schemes and décor styles.TWO..
ECLECTIC DESIGN: The light-toned gray woodgrain color and sleek lines of the Midsleeper bed coordinate with most colors and bedroom themes that children love, so it will adapt to kids changing favorites!BUILT TO LAST: Made from top-grade MDF boards, and joined with heavy-duty steel hardware, .. CONTEMPORARY STYLE: Light gray woodgrain and streamlined design is modern and on-trend for today’s designer colors, and coordinates with most home décor styles and color schemes.DURABLE CONSTRUCTION: Made from top-grade MDF boards, and joined with heavy-duty steel hardware, so the bed stays s..
TWO-TONE COLOR: Light gray Ash woodgrain and Light Concrete veneer finishes combine to create a soft color palette that is neutral and coordinates with most color schemes.SPACE-SAVING STORAGE: Get one drawer, or one for each side of the twin bed, providing lots of storage space for extra bed ..